31611 BENJAMIN LEWIS VULLIAMY, LONDON, NO 781. A FINE ARCHITECTURAL CASED MAHOGANY LONGCASE CLOCK BY THIS FAMOUS MAKER. DATED 1824. 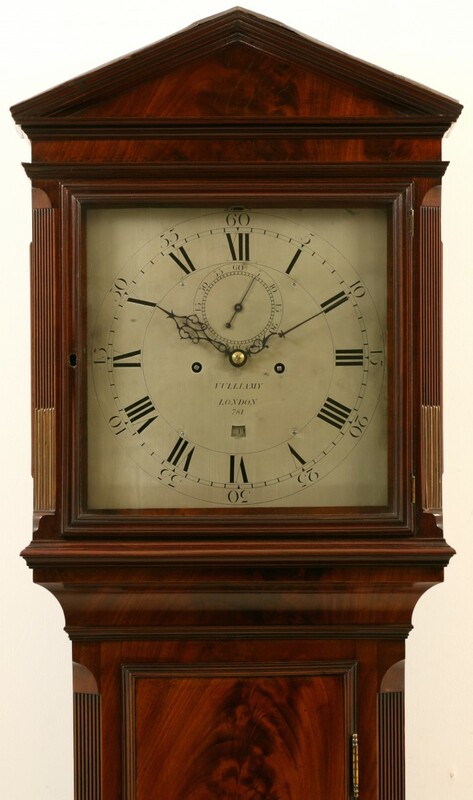 A fine mahogany longcase clock by this famous maker. The case has the typical architectural pediment to the hood with very fine mouldings and well chosen veneers. It has the later style of canted corners which are reeded and brass inlaid, as are the corners of the main trunk. The veneers on the front of the case are nicely matched and proceed down through the door to the panelled base which stands on a double plinth. The mouldings throughout the clock are of the finest quality. The silvered brass dial is signed and numbered for the maker ‘Vulliamy, London, 781’. It has Roman numerals to the main chapter ring with outside Arabic numerals for the minutes. There is a large seconds ring below XII and a date aperture above VI. The hands are of blued steel. 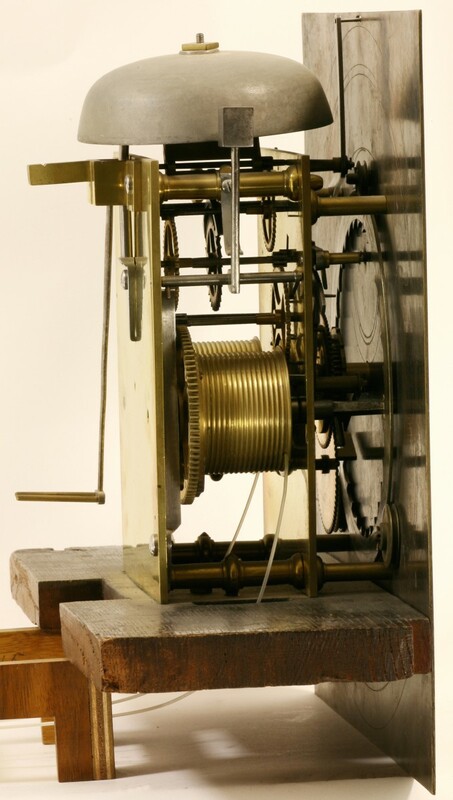 The fine quality eight day movement has nicely knopped pillars, fine wheel work and strikes the hours on a bell mounted at the top of the movement. It has a lozenge shaped wood rod pendulum with an extremely heavy brass bob and has two brass cased weights. 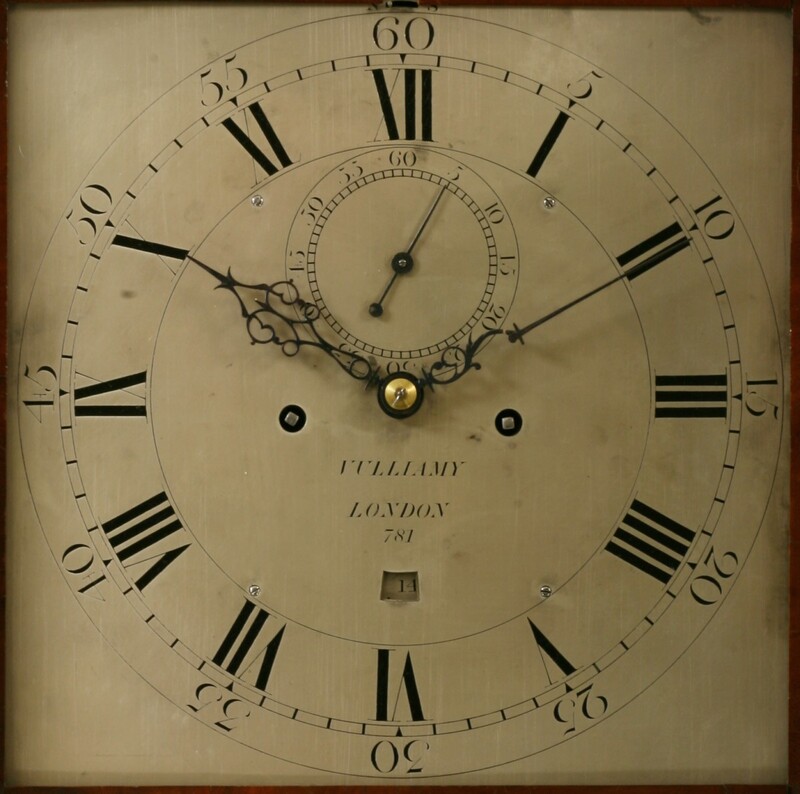 Benjamin Lewis Vulliamy was born on the 25th January 1780 and was the last of a line of exceptional clockmakers in the Vulliamy family. He was Free of the Clockmakers’ Company in December 1809 and Liveryman in January 1810, the same year he was admitted to the Court of the Guild. There he served every office in the Court and was five times elected Master. In his years of service he did much to further the good reputation of the clockmakers’ trade and against increasing odds he succeeded at preserving high standards of craftsmanship which can be seen in all of the clocks he produced. He died in 1854.